Southwest Airlines (Dallas) has announced it will begin international service for Indianapolis travelers with new weekly service to Cancun, Mexico as the carrier extends its schedule through April 6, 2018. The new flights between Cancun and Indianapolis will operate seasonally on Saturdays beginning March 10, 2018. As part of today’s flight schedule extension, the carrier is also offering new international service beginning March 8, 2018 between Ft. Lauderdale/Hollywood and Aruba. Additionally, new nonstop service offered daily between Milwaukee and Houston (Hobby) will allow connections to destinations such as Belize, Cancun and Mexico City. *Purchase from July 27 through August 3, 2017, 11:59 p.m. in the respective time zone of the originating city. Domestic and International travel is valid March 8 through April 6, 2018. Service begins March 8, 2018. Domestic travel is not valid on Fridays and Sundays. International travel is valid Monday through Thursday. Southwest begins seasonal weekly service on Saturdays between Detroit and Tampa as well as Omaha and Tampa. The Company ended second quarter 2017 with 735 aircraft in its fleet. This reflects the second quarter 2017 delivery of 13 new Boeing 737-800s and 5 pre-owned Boeing 737-700s, as well as the retirement of 10 Classic aircraft. During the second quarter, the Company also added three pre-owned 737-700 aircraft to its fleet order book to be delivered this year for 2018 service. Subsequent to June 30, 2017, the Company added one additional pre-owned 737-700 aircraft to its fleet order book to be delivered this year for 2018 service. With the addition of these four pre-owned 737-700 aircraft to its order book, the Company deferred its four remaining 737-800 options in 2018 and converted them to four Boeing 737 MAX 8 options, two in 2021 and two in 2022. As of July 25, 2017, there were 67 Classic aircraft remaining in the Company’s fleet that it intends to retire by the end of third quarter 2017. Total aircraft, net of all Classic retirements, is expected to decline to 707 by year-end 2017 and grow to 750 aircraft by year-end 2018, as previously announced. The Company currently expects its third quarter 2017 available seat miles (ASMs) to increase in the four to five percent range and its fourth quarter 2017 ASMs to increase in the one to two percent range, compared with the same year-ago periods. While the Company has not finalized its 2018 capacity plans, it currently estimates year-over-year ASM growth to be less than four percent in the first half of 2018, and its full year 2018 ASM growth to be less than its 2016 year-over-year ASM growth of 5.7 percent. Additional information regarding the Company’s aircraft delivery schedule is included in the accompanying tables. The Company continues to fine tune its network and introduce new markets that not only strengthen its Customer brand appeal, but also support its revenue and profitability targets. In late April, the Company began international service daily between San Diego and San Jose del Cabo/Los Cabos, Mexico. In June, the Company consolidated its Ohio operations and launched service to Cincinnati/Northern Kentucky International Airport. The same day, the Company also launched service to Grand Cayman from Ft. Lauderdale-Hollywood International Airport (FLL). Additionally, the Company has announced plans to concentrate its service to Cuba in Havana and will cease operations at Varadero and Santa Clara in September. In November, the Company expects to begin international nonstop service weekly from both Nashville and St. Louis to Cancun (CUN), as well as daily service between Providenciales, Turks & Caicos and FLL beginning in the same month, all subject to requisite governmental approvals. And just this morning, the Company published a flight schedule extension through April 6, 2018, which includes new international service weekly between Indianapolis and CUN that is expected to begin in March 2018 and is also subject to governmental approvals. 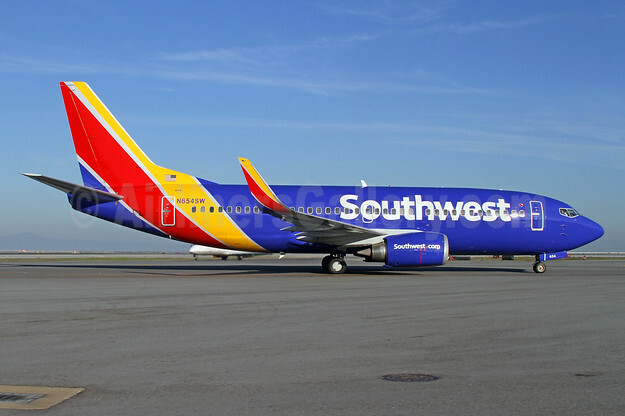 Top Copyright Photo: Southwest intends to retire its last Boeing 737-300 by the end of the third quarter. By agreement, the new Boeing 737 MAX 8 will be introduced when the last 737-300 is retired. Southwest Airlines Boeing 737-3H4 HL N654SW (msn 28399) SFO (Mark Durbin). Image: 925717. This entry was posted in Southwest Airlines and tagged Boeing 737-3H4 HL, msn 28399, N654SW, SFO, Southwest Airlines on July 28, 2017 by Bruce Drum. Spirit Airlines, Inc. reported second quarter 2017 financial results. GAAP net income for the second quarter 2017 was $78.1 million ($1.12 per diluted share), or $79.1 million ($1.14 per diluted share)1excluding special items. GAAP operating margin for the second quarter 2017 was 18.9 percent, or 19.1 percent excluding special items1. Spirit ended the second quarter 2017 with unrestricted cash, cash equivalents, and short-term investments of $969.6 million. Spirit’s return on invested capital (non-GAAP, before taxes and excluding special items) for the twelve months ended June 30, 2017 was 20.3 percent2. For the second quarter 2017, Spirit’s total operating revenue was $701.7 million, an increase of 20.1 percent compared to the second quarter 2016, driven by a 9.3 percent increase in flight volume and a 7.1 percent increase in operating yields. Total revenue per available seat mile (TRASM) for the second quarter 2017 increased 5.7 percent compared to the same period last year. During the second quarter 2017, the Company’s results benefited from the calendar shift of Easter, as well as Company driven revenue initiatives and a strong underlying demand environment. On a per passenger flight segment basis, total revenue for the second quarter 2017 increased 8.5 percent year over year to $113.07 with ticket revenue per passenger flight segment increasing 13.4 percent to $59.93 and non-ticket per passenger flight segment increasing 3.5 percent to $53.14. For the second quarter 2017, total GAAP operating expense, including special items of $1.5 million3, increased 23.1 percent, or $106.6 million, year over year to $568.9 million. Adjusted operating expense for the second quarter 2017 increased 25.1 percent, or $113.7 million to $567.5 million4. The increase in both GAAP and adjusted operating expense was primarily driven by an increase in flight volume, higher passenger re-accommodation expense (recorded within other operating expenses), and higher fuel rates. Aircraft fuel expense increased in the second quarter 2017 by 25.7 percent, or $29.1 million, compared to the same period last year, due to a 12.9 percent increase in the cost of fuel per gallon and a 11.1 percent increase in fuel gallons consumed. Spirit reported second quarter 2017 cost per available seat mile (“ASM”), excluding special items and fuel (“Adjusted CASM ex-fuel”), of 5.83 cents4, an increase of 10.0 percent compared to the same period last year, driven primarily by higher passenger re-accommodation expense per ASM and higher depreciation and amortization per ASM. During the second quarter 2017, the Company had over 850 pilot-related flight cancellations. The Company estimates these pilot-related cancellations adversely impacted its second quarter 2017 results by approximately $45 million (approximately $25 million of revenue loss and $20 million of additional operating costs, primarily related to higher passenger re-accommodation expense). The Company estimates that had these cancellations not occurred, TRASM for the second quarter would have been up approximately 6.5 percent year over year (with the Easter shift accounting for approximately 400 basis points of the year over year increase) and Adjusted CASM ex-fuel would have been up approximately 2.0 percent year over year. “While our cost performance for the second quarter was not satisfactory, we do not believe it materially changes our long-term cost outlook and are confident that we will continue to maintain, or grow, our relative cost advantage,” said Ted Christie, Spirit’s Executive Vice President and Chief Financial Officer. Spirit and its pilots, represented by the Air Line Pilots Association, remain in open contract negotiations under the supervision of the National Mediation Board. Spirit took delivery of three new A320ceo aircraft and one new A321ceo aircraft during the second quarter 2017, ending the quarter with 104 aircraft in its fleet. 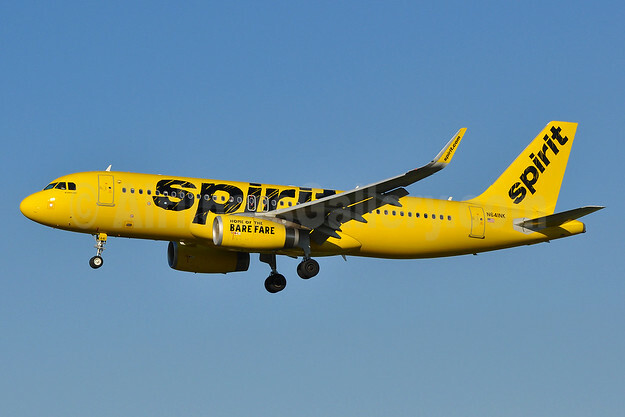 Copyright Photo: Spirit Airlines Airbus A320-232 WL N641NK (msn 6566) BWI (Tony Storck). Image: 928992. This entry was posted in Spirit Airlines and tagged Airbus A320-232 WL, BWI, msn 6566, N641NK, Spirit Airlines on July 28, 2017 by Bruce Drum. FAT – Far Eastern AIr Transport (Taipei-Songshan) has officially introduced its first ATR 72-600 (ATR 72-212A) (B-28068, msn 1110, ex Jettime OY-JZA) at a hangar event at Songshan Airport. FAT is planning to start operations soon with new type after CAA certification. All copyright photos by Manuel Negrerie. This entry was posted in Far Eastern Air Transport-FAT and tagged 1110, ATR, ATR 72, ATR 72-212A (ATR 72-600), ATR 72-600, B-28068, Far Eastern Air Transport-FAT, FAT on July 26, 2017 by Bruce Drum. WestJet Airlines (Calgary) has announced an additional 55 weekly nonstop flights this winter from Toronto Pearson International Airport to key domestic business destinations as well as popular sun spots in the U.S., Mexico and the Caribbean. The service is part of the airline’s seasonal schedule for the winter of 2017-18. Toronto–Montreal, from 83 to 91 times weekly (14 times each business day). Toronto–Ottawa, from 77 to 85 times weekly (13 times each business day). Toronto–Vancouver, from 45 to 52 times weekly (eight times each business day). Toronto–Calgary, from 56 to 68 times weekly, more than any other carrier (10 times each business day). Toronto–Winnipeg, from 31 to 38 times weekly (six times each business day). Toronto–Kelowna, from five to seven times weekly. Toronto–Orlando, from 12 to 15 times weekly. Toronto–Fort Lauderdale/Hollywood, from 11 to 14 times weekly. Toronto–Cancun, from 11 to 15 times weekly. Toronto–Montego Bay, from 13 to 14 times weekly. Toronto–Nassau, from seven to nine times weekly. Toronto–Liberia, from four to five times weekly. Toronto–Antigua, from two to three times weekly. Toronto–Punta Cana, from six to seven times weekly. Toronto-Puerto Plata, from five to six times weekly. WestJet also announced the addition of dozens of new flights across Canada. The additional flights deliver optimized service for both the business and leisure traveller and give Canadians greater connectivity into and out of WestJet hubs in Vancouver, Calgary and Toronto, providing more flight frequency between key routes, better scheduling and greater access from smaller airports into the wider WestJet network. New nonstop weekly service from Calgary to Belize City, Belize. New nonstop weekly service from Edmonton and Vancouver to Huatulco. Service from both Regina and Abbotsford to Puerto Vallarta will increase by one weekly flight for a total of twice weekly. Additional flights from Edmonton to a number of domestic and international destinations including Cancun, Abbotsford and Victoria. Additional flights from Calgary to a number of sun destinations including Cancun, Cabo San Lucas, Los Angeles, Phoenix, Palm Springs and Puerto Vallarta. Additional flights from Calgary to a number of domestic destinations including Kitchener, Fort McMurray, Grande Prairie, Kelowna and Brandon. Additional flights from Vancouver to a number of domestic and international destinations including Cancun, Puerto Vallarta, Fort St. John, Calgary, Edmonton and Fort McMurray. Extension of existing summer service increases through the winter including three daily flights between Toronto and Moncton, six daily flights between Edmonton and Kelowna and 12 weekly flights between Calgaryand Houston. This winter WestJet will operate an average of 700 daily flights to 93 destinations including 37 in Canada, 22 in the United States, 33 in Mexico, the Caribbean and Central America and one in Europe. 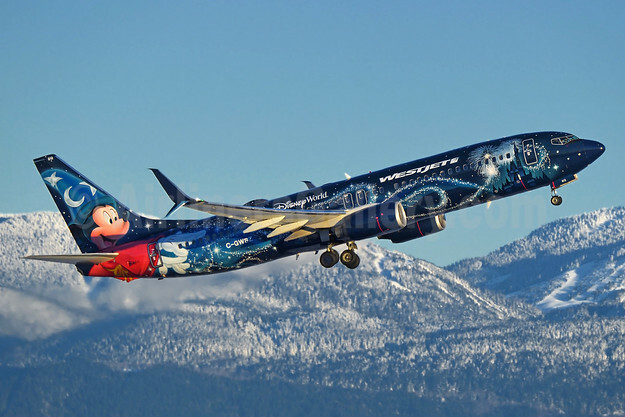 Copyright Photo: WestJet Airlines Boeing 737-8CT SSWL C-GWSZ (msn 37092) (Walt Disney World – Magic Plane) YVR (Steve Bailey). Image: 936503. This entry was posted in WestJet and tagged Boeing 737-8CT SSWL, C-GWSZ, msn 37092, Walt Disney World - Magic Plane, WestJet, YVR on July 25, 2017 by Bruce Drum. Hawaiian Airlines (Honolulu) has announced the first schedules for its upcoming new Airbus A321neo aircraft. The first A321 daily route will be between Kahului, Maui and Portland, Oregon starting on January 18, 2018. The second route will be between Kona, Hawaii and Los Angeles starting on March 11, 2018. The third route will connect Lihue, Kauai with Oakland commencing on April 11, 2018. Hawaiian Airlines will expand its U.S. West Coast presence with the arrival of an A321neo fleet by adding three new nonstop daily routes early next year: Portland-Maui; Oakland-Kaua‘i; and Los Angeles-Kona. The new A321neo service between Portland (PDX) and Maui (OGG) will launch on January 18. Hawaiian’s seasonal widebody service currently offered between Oakland (OAK) and Kaua‘i (LIH) through September 4 will resume April 11 as a daily A321neo flight. Daily service between Los Angeles (LAX) and Kona (KOA) on the Island of Hawai‘i launches March 11 with widebody aircraft before the A321neo is introduced in the summer of 2018. Hawaiian’s inaugural A321neo flight between the U.S. West Coast and Hawai‘i is planned for January 8 on its existing OAK-OGG service. Additional routes will be announced as Hawaiian welcomes 18 new A321neo aircraft between the fourth quarter of 2017 and 2020. Hawaiian’s signature style flows throughout the A321neo’s three cabins, including 16 luxurious leather recliners in the Premium Cabin, 45 Extra Comfort premium economy seats, and 128 Economy class seats. All seats are equipped with complimentary high-power USB outlets for device charging, while guests in the Premium Cabin and Extra Comfort seats will enjoy access to an additional AC power outlet. Pivoting overhead bins maximize the space for carry-on luggage. Hawaiian carefully designed its A321neo cabin interiors with textiles and materials that reflect traditional island crafts, from bark cloth (kapa) to fishing nets, and even LED lighting mirroring Hawai‘i’s idyllic sunrises and sunsets. New to Hawaiian’s guest experience, the A321neo will feature wireless streaming in-flight entertainment. Guests will be able to simply download an application on their personal electronic devices to enjoy a wide selection of complimentary and premium content, including movies, TV shows, music and other exclusive programming. Holders for personal hand-held devices and tablets will be integrated into the tray tables of the Premium Cabin as well as the first row of Extra Comfort, and built into the backrest of all other seats. The A321neo boasts the quietest and most fuel-efficient engines for this aircraft type, along with aerodynamic wingtips called Sharklets that significantly reduce carbon emissions. This entry was posted in Hawaiian Airlines and tagged A321, A321neo, Airbus, Airbus A321, Airbus A321neo, Hawaiian Airlines on July 25, 2017 by Bruce Drum. Air Côte d’Ivoire, the Ivory Coast’s flagship airline based in Abidjan, received its new Airbus A320 at a ceremony that was held at the Airbus Delivery Centre in Toulouse on Monday, July 17, 2017. This ceremony was jointly presided over by Didier Evrard, Airbus Executive Vice President Programmes and General Abdoulaye Coulibaly, Chairman of Air Côte d’Ivoire’s Board of Directors. Air Côte d’Ivoire already operates six Airbus aircraft (four A319s and two A320) in the framework of a leasing contract. Air Côte d’Ivoire operates 25 different domestic routes in West Africa and Central Africa. The cabin of the aircraft is configured in two classes (16 business class and 132 economy class seats). The business class offering provides an unbeatable level of comfort with the new “Celeste” seat provided by Stelia Aerospace, while the economy class provides a high level of service, particularly in terms of the lighting system and internet connectivity. Photo: Airbus. Airbus A320-214 TU-TSV (msn 7742) was the new aircraft accepted. This entry was posted in Air Cote d'Ivoire and tagged Air Cote d'Ivoire, Airbus A320-214, msn 7742, TU-TSV on July 23, 2017 by Bruce Drum.